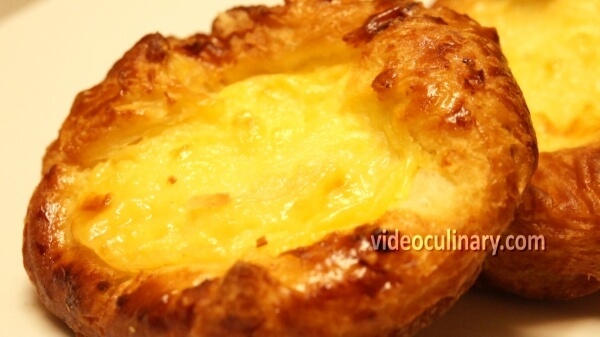 Pastry cream filled Danish is a great breakfast or brunch pastry. 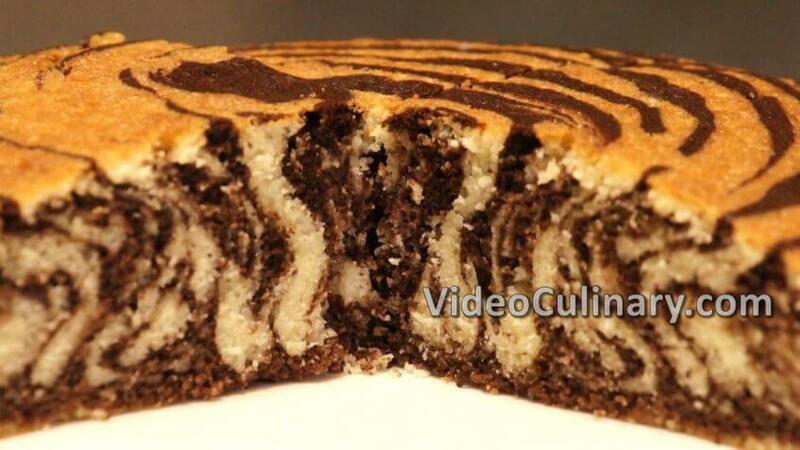 Danish is an enriched laminated (layered) pastry. 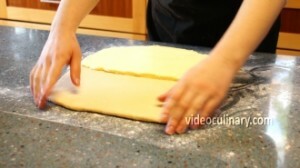 Layers of dough and fat cause expansion and rise, resulting in a flaky, delicate pastry. 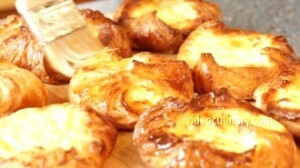 Danish, croissant and puff pastry are similar in preparation; Danish and croissant are made with the addition of yeast, and are softer inside than puff pastry. Danish is more enriched than croissant dough. Sift 700 grams of flour (25 oz) into a mixing bowl. Add 10 grams of salt (two teaspoons), 80 grams (3 oz) of sugar and 10 grams (2 teaspoons) of instant dry yeast. 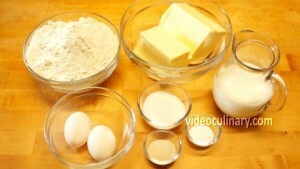 Mixing on low speed, add two eggs, 350 ml (12 fl oz) of room temperature milk, and 60 grams (2 oz) of soft butter. Mix on medium speed, using the hook attachment, for 4 minutes. Shape into a round, cover and let rise until doubled in size, about 2 hours. 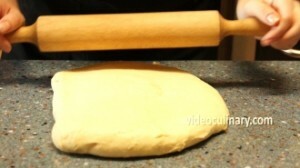 Make a three-fold: Visually divide the dough into 3 parts. 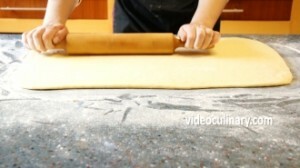 Brush away any raw flour. 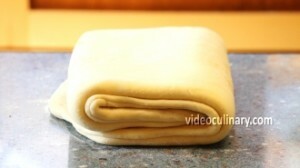 Fold one third of the dough over the center third, then fold the remaining third over the dough. 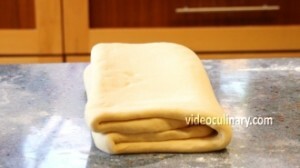 Refrigerate for 30 minutes, and repeat once more, for two three-folds. Make the pastry cream: Combine 300 ml (10 fl oz) of the milk with 60 grams (2 oz) of the sugar in a saucepan stir and bring to boil. Combine three eggs, 60 grams (2 oz) of sugar, 30 grams (1 oz) of starch and 150 ml (5 fl oz) of milk in a bowl. Mix well until the mixture is smooth. 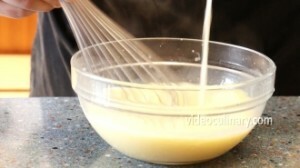 Stirring with a whisk, gradually add the hot milk into the egg mixture. 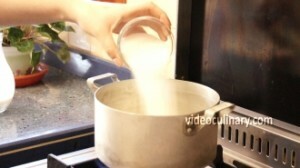 Return the mixture to the saucepan. 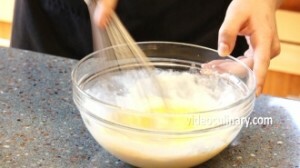 Stirring with the whisk, continue cooking until the pastry cream is thick. Remove from the heat, add 50 grams (2 oz) of butter and stir until melted. 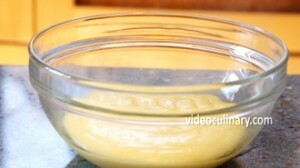 Transfer to a bowl, cover with plastic wrap directly on the surface of the pastry cream to prevent a crust from forming. Cool completely. 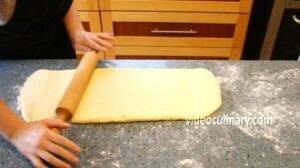 Remove the Danish dough from the fridge, roll into a rectangle approximately 65×25 cm (25×10 inch). 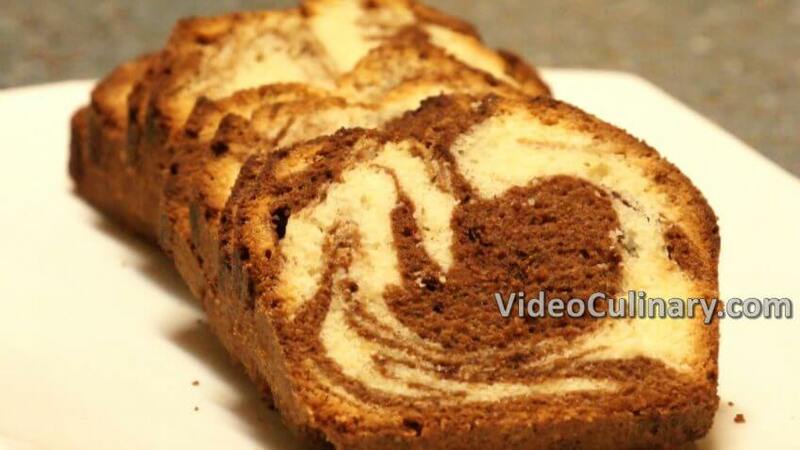 Cut the dough into 24 squares. 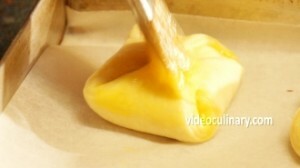 Use a pastry bag fitted with a plain tip and pipe the pastry cream in the center of each square. 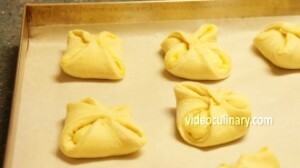 Fold the corners of the dough together and seal. Transfer to a sheet pan lined with parchment paper, cover, and let rise for an hour and a half. Brush with egg wash and bake at 180°C (350°F) until golden brown, 15-20 minutes. Make the apricot glaze: Mix together 70 grams (2.5 oz) of apricot jam and 30 ml of water. 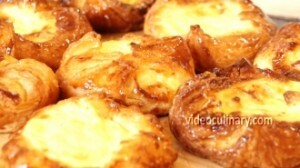 Brush with the apricot glaze while the pastry is still hot, cool to room temperature and serve. 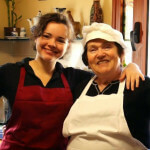 Thank you so much for using our recipes! 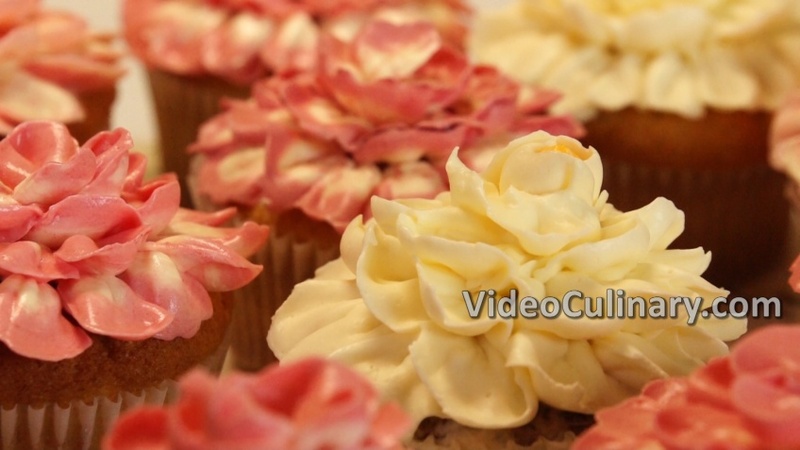 Please visit our website for a braided apple filled Danish coffee cake, Danish pastry rolls (Schnecken), and other detailed recipes of bakes goods.